I am a picky eater, and I've kind of always been particular about I eat. I had a lot of tummy issues growing up, and I think my love for fruit and eating healthy, plus food sensitivities brought me to where I am today. I want to eat fresh foods, I don't want to eat food that not only traveled across the country, but also has been living in a plastic bag for weeks. I want to know exactly what I'm eating, and where the ingredients came from. This means we eat at home a lot - which I love! It also means that when we are pinched for time, there are a small number of places we will eat. Our go to fast(er) food places are Chipotle and Vui's Kitchen. This summer while I was training for the Chicago Marathon, I had a slight case of food poisoning the night before and then again after my run. It was the only long run I did inside, you know, easy access to bathrooms... I needed something that would be easy on my stomach, and Vui's pho was just the remedy. I now associate it with magical healing powers. One of my goals for this year of my life was to make vegetable broth from scratch, and making pho broth was the perfect stepping stone to fulfill this goal. Here's a little disclaimer - like I said, I am a picky eater. This means in the past I have been a little bit reluctant to try new things. That being said, I must admit I am NOT an expert on Vietnamese cooking by any means. However, through much trial and error, I have discovered several important inclusions that add to the flavor of this broth. I LOVE charred vegetables. SO MUCH. From romaine to carrots and beets, I'm into it. Charring the onions over the open flame of my stove brought me so much joy. I added finely chopped cilantro and threw in some stems. I think this adds a bit of sweetness, in addition to the ginger peels. I added all the ginger peels to the broth, and wowza... it really does add a lot of flavor! It also uses something that you would probably otherwise throw away! (Speaking of peels - I also save carrot peels and add them to the broth as well!) Another note on the ginger - before I added the charred ginger to the broth, I cut each part in half, and also used my garlic press with part of it. The first time I made this broth, I only let the broth simmer for 30 minutes. We realized that it was missing a certain sweetness. The next couple times, I let the broth simmer for 2 hours and sometimes even longer than that. Time to simmer is a gift to this broth, and ultimately your taste buds. If this is your first time making broth from scratch or if you don't have 1 - 2 hours, you can add a bit of vegetable stock to help the taste. I also just started adding coconut oil for some added fat, adding healthy fats to my diet is something that I working really hard to do. 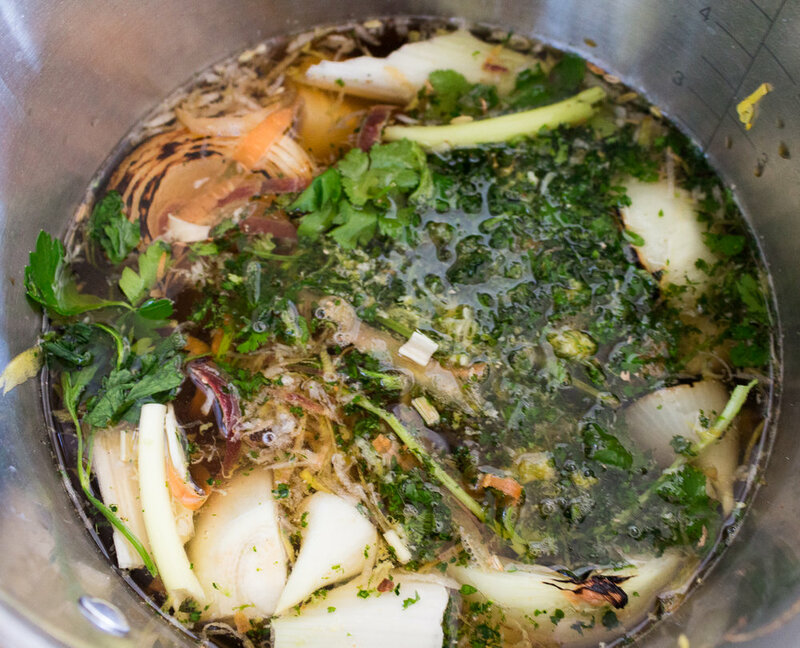 Do you make your own pho broth? If so, I would love to hear how you make yours and what you like to top it with! WHOA I just had a little brain spark - I think I might have a PHO PARTY!! I will keep you updated! In the meantime - knock someone's socks off with this tasty treat! Leave me a comment and let me know what you think! Make sure you're following me on Instagram @corrielanderson, post a photo of your beautiful creation, tag me, and use #itsallofit! Char the onion and ginger over a flame via gas stove or grill. You can also do this under a broiler or in a dry pan on in electric stove. Use tongs to hold the onion and ginger over an open flame. Continue until all sides are charred. Add the star anise, coriander seeds, cinnamon stick, cloves, and peppercorns to a large pot over medium heat, stir often to prevent burning. Dry roast the spices until they are fragrant. 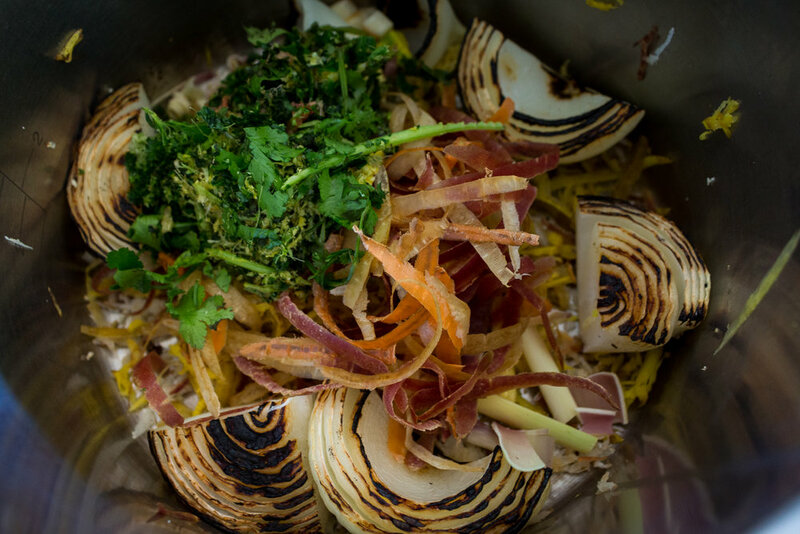 Next, add the charred onion, ginger, ginger peels, carrots, lemon grass, cilantro (stems too! ), soy sauce, vegetable stock, and water to the pot. Bring to a boil, and then cover and simmer for 1 to 2 hours (or longer if you can). To serve, add noodles and toppings to a large bowl. Slowly pour the broth over top. Enjoy! * I chopped the ginger after charring it. I also put some through a garlic press because I think ginger juice is delicious and has magical healing powers!